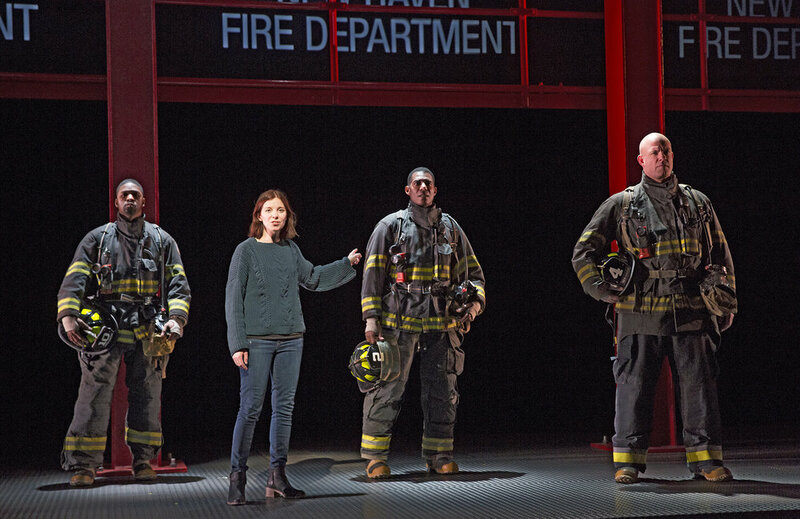 When Karen Hartman, or at least the nom de plume of Hartman played winningly by Laura Heisler, says those words at the beginning of Yale Repertory Theatre’s “Good Faith: Four Chats About Race and the New Haven Fire Department” she is wrong. “Good Faith,” which was commissioned by the Rep and had its world premiere February 7th, is neither boring or offensive. It’s a smart, surprisingly engaging piece of docudrama that seeks to make sense out of a thorny and controversial event in New Haven’s history. It’s an imperfect work – “Faith” occasionally drags and is overly verbose – but a fascinating one nonetheless, directed with a steady hand by Kenny Leon (recently of Broadway’s “Children of a Lesser God”). Before we get to Ricci v. DeStefano, we meet The Writer sitting alone on a fairly blank stage. Stephanie Osin Cohen’s utilitarian set mostly consists of red, crisscrossing beams and diamond-plated metal floors; settings and dates, a la “Law & Order,” are projected above the stage along with some distractingly bad fire animations that look right out of an early ‘90s screensaver. Having Hartman write herself into the play is a gamble, but one that pays off. Laura Heisler has the ease of a stand-up comic and immediately feels so disarmingly charming that when she discusses why a white, Ivy-league educated, Jewish woman should be the one to tell this story it doesn’t come across like a complete cop-out. “It is hard…if you’re a man to think about a woman’s experience or if you’re white to think about a black person’s experience,” she tells the audience, “and I’m not going to claim, ‘Oh I’m white, race has nothing to do with me, I’m neutral.’” What she does claim – successfully – is that her aim is “go to the heart of another, to guide you to the heart of another…with kinship and affinity.” Hence, good faith. Luckily, Hartman doesn’t get bogged down in the specifics of the case and instead tells a story about how this event reverberated through the lives of four people involved and the issues it drudged up. African-American Tyrone (Rob Demery) was one of the firemen who scored low on the exam. Mike (Billy Eugene Jones), also African-American, left the firehouse after many years to become the director of New Haven’s 911 call center. He successfully filed his own lawsuit in 2011 on the grounds that the exam was weighted (60% for the written portion, 40% for the oral) unfairly in favor of white employees. Frank (Ian Bedford), now a fire chief, is one of the New Haven Twenty and the Ricci in Ricci v. DeStefano. Karen Torre (Rene Augessen) was the lead prosecutor on the case. In one scene, The Writer meets with Tyrone and Mike in a diner. In another, she visits Torre at her Thimble Islands home. In the last, Mike and Frank finally discuss the case face to face. Each vignette is quite interesting, tying in many threads from institutional racism and Black Lives Matter to the 2016 election and sexism. It doesn’t offer any easy answers – or answers at all – but Hartman does a thing that’s simple but rare this day and age. She lets people share their points of view without interruption or judgment. There are no villains in this story, at least how Hartman tells it, just a whole mess of people trying to do the right thing through the lens of their experience. There are a plethora of good ideas and the cast is terrific, but at over two hours “Good Faith” wears thin and is often more intellectually stimulating than it is theatrically. At certain points, I felt lectured at rather than talked to. Perhaps, too, Hartman restated a bit too much; despite the best efforts of the cast, half the time her characters come across as fully fleshed-out individuals speaking from the heart while the other half they pontificate like well-rehearsed guests on a CNN panel debate (“Policy is a blanket, so it usually covers up the issues that are underneath”). Since it’s a based on a specific incident in New Haven, Connecticut (and was commissioned by Yale), it will be interesting to see if “Good Faith” moves beyond the Elm City. With some rewrites and a few healthy cuts, I believe it has the legs to do so. In 2016, a study found that New Haven has the closet demographics to that of the entire United States. Meaning that based on our make-up of age, education, race and ethnicity we closely mirror the national average. Although unspoken, “Good Faith” understands that. It’s not really a play about New Haven firefighters; it’s about all of us. The world premiere of “Good Faith: Four Chats about Race and the New Haven Fire Department” by Karen Hartman, directed by Kenny Leon, runs through February 23, 2019 at Yale Repertory Theatre (1120 Chapel Street). “Good Faith” features scenic design by Stephanie Osin Cohen, costumes by Beatrice Vena, lighting by Stephen Strawbridge, sound by Kathryn Ruvuna, projections by Zak Borovay and technical direction by Kevin Belcher. The cast includes René Augesen, Ian Bedford, Rob Demery, Laura Heisler, and Billy Eugene Jones.